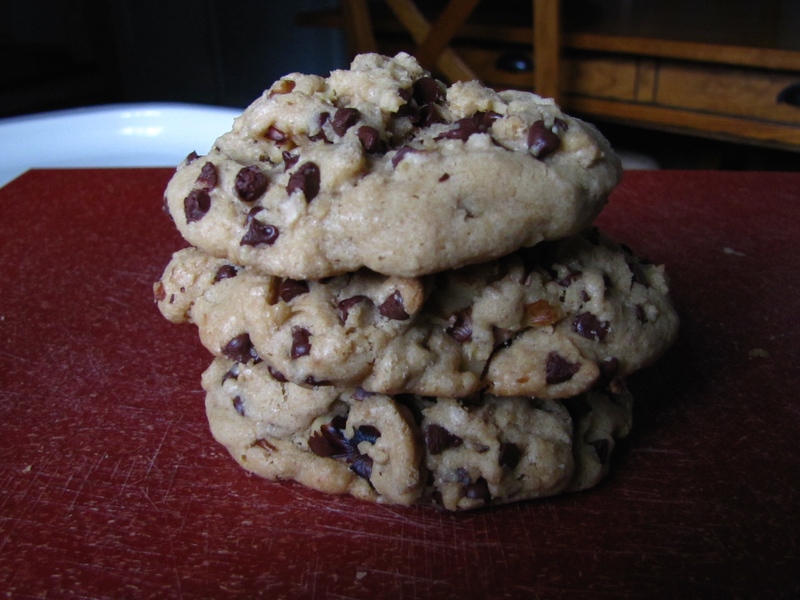 Thick and Chewy Chocolate Chip Cookies – Voila! Taking pictures of food can be challenging. The challenges are different than, let’s say, taking a photo of an active baby. You would think food would be easier. Food is an inanimate object. It doesn’t move. It stays still and I have complete control over what they look like. And therein lies the problem. The light, the composition, the arrangement, background, everything is up to me. So it took me about 25 minutes and 36 photos – in various arrangements in different parts of my house — of these cookies before I narrowed it down to these two images. I looked up other cookie recipes to see how they photograph and here are the common factors: A. Good, natural lighting B. Cookies are stacked C. Cookies are fanned out or layered somehow on top of each other D. If it is just one cookie being photographed, it’s close up and usually on the cookie sheet indicating freshness. To focus in on these cookies for a moment — they are deeeeeelicious and live up to the name. They are thick and chewy, and let’s add addicting. It’s really hard to have just one. You can trick yourself into believing you only had one, and the one you nibbled at (read: ate the whole thing) doesn’t count because technically it was on the cookie sheet and not on your plate. Whisk flour, baking soda, salt in medium bowl and set aside. By hand or with an electric mixer, mix butter and sugars in large bowl until thoroughly blended. Beat in egg, yolk and vanilla until combined. Roll scant 1/4 cup of dough into a ball. Then, you take the dough and twist it into two halves. Rotate the two halves 90 degrees so the “jagged” surfaces are pointing up. Recombine the halves by pushing them beck together at the base with the jagged surface pointing out. For those of you about to skip this step, here’s why: this ensures an evenly thick, chewy cookie throughout! Place dough on prepared cookie sheet and bake for 15-16 minutes. Rotate baking sheets from top to bottom halfway through. 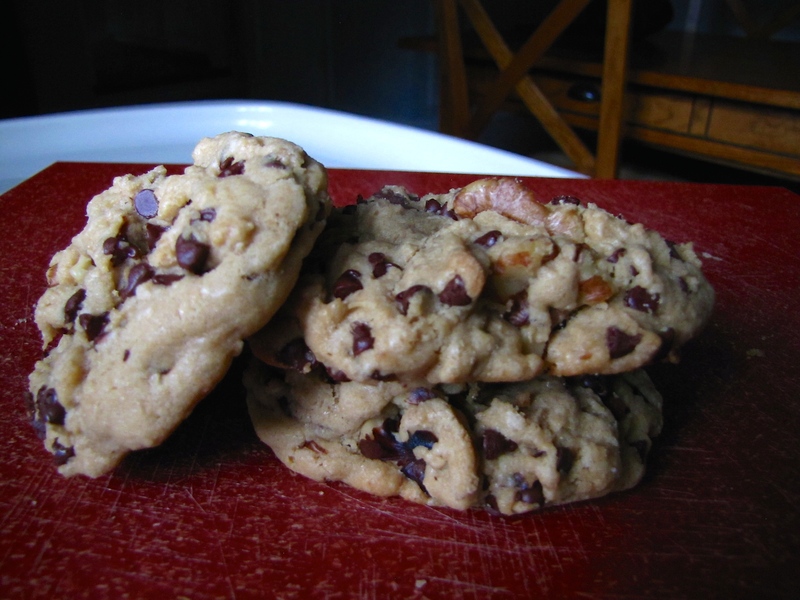 When cookies are done, look for: edges that are lightly golden brown, but the centers still look soft and puffy. They do look Delicious! I’ll see how long I can go without making them (problem is making them leads directly to eating them.